Today, as environmental concerns increasingly become center stage issues, transit operators are beginning to look into ways to improve air quality in their communities while increasing quality of service. Zero-emission public transit is an essential, visible step in the move to a greener future, so transit planners and managers need to be armed with the best information on how to make the transition towards electrification of transit fleets. Hydrogen refueling station for Stark Area Regional Transit Authority in Ohio, USA. This means zero-emission transit is now a priority, or should be, for all transit agencies. Although zero-emission transit is becoming increasingly necessary, many transit operators are unsure of how to make the transition, and how to replace their existing infrastructure. Fortunately, there are several communities who have already started the transition from traditional diesel or CNG powered fleets to zero emission hydrogen powered electric buses. The SARTA system in Ohio, USA; and the city of Aberdeen, Scotland are just two of a growing number of global communities that are now deploying fuel cell electric buses in their fleets. The recently released NewBusFuel European report provides detailed guidance on the feasibility of transitioning to large scale hydrogen powered bus fleets. 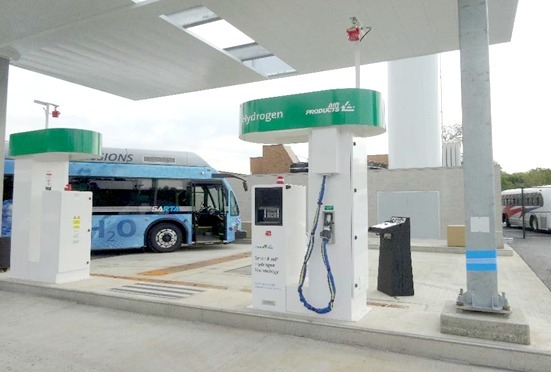 In addition, the Calstart report, published a few months ago, reviews best practices in hydrogen fueling and maintenance facilities for transit agencies in the US. So if you are ready to start reducing emissions in your community, know that you can lean on the experiences of progressive transit operators and researchers who have been working hard to bring zero-emission public transit to city streets. Both CNG and hydrogen require dedicated fuel depot infrastructure. You will need to accommodate hydrogen fueling infrastructure into your site plan. Comments have come back from operators that not enough space was initially allocated for the hydrogen refueling station. As a result, refueling became more challenging than necessary. Studies have shown that a 75 to 80 bus hydrogen refueling stations (including liquid H2 storage) would use around 400m2 (4,300ft2). Refuelling times between the two fuels are virtually the same. In addition, buses will have the same daily range on a full tank of hydrogen when compared to CNG. Fuelling protocols are simple and well documented for both fuels, and involve connecting the fuel depot hose to the bus. People familiar with CNG refuelling procedures will find hydrogen is very similar to use. Fleet size directly relates to the size of refuelling infrastructure that is needed, but you must consider the future of your agency. You should ensure there is enough available hydrogen to fuel your fleet, while still keeping your infrastructure size in proportion. Make a larger investment in on-site infrastructure up front and share the excess capacity with the public (who are also embracing hydrogen fuelled vehicles). As your fleet grows, so will the public’s demand for more hydrogen fuelling stations. At some point, there will be enough infrastructure to allow for transit agency fueling only within your built facility. Start by installing a small hydrogen refueling station without on-site production, using delivered compressed gas or liquid hydrogen. Continuous fleet ramp-up: adding a smaller amount of buses to the fleet at smaller time intervals, for example, between five and ten buses each year. This is, however, not the ideal solution, as it leads to a higher unused amount of fuel, and overcapacity in the infrastructure. According to the NewBusFuel report, many transit operators who started with this method eventually made the switch to the step-wise method, below. Step-wise procurement: adding a larger amount of buses to the fleet at larger time intervals, for example, twenty to fifty new buses every three years. This method is less expensive and leads to lesser amounts of unused fuel. There will still be some unused fuel, but less than with the continuous ramp-up. As the fleet size grows, the hydrogen station must be expanded in terms of hydrogen compression and storage capacity. The preferred means of refueling is termed “fast fill”, where fuelers drive each bus to the dispenser, perform the fueling process, and return the bus to the storage area. Typically, a fuel cell bus requires 30 kilograms of hydrogen per day and the fill time is approximately 7-10 minutes, similar to the refueling time of a diesel bus. The time at the dispenser can be partially offset by completing other mandatory maintenance such as bus cleaning, checking fluid levels, or emptying the fare box during fueling time. To speed up the refueling process for a large fleet, operators may also choose to add additional dispensers. To successfully transition to fuel cell electric buses, the refuelling infrastructure needs to be strategically considered and planned out. Learn from resources like the NewBusFuel and Calstart reports as well as the experiences of other transit operators and hydrogen infrastructure equipment suppliers. This will help you gain insights on what you need to know as you move forward with the transition. The resources and knowledge that are available is growing every day, so keep yourself informed, and know that the time to transition to zero-emission is now. If you do so, you’ll be an inspiration to many other forward-thinkers who want to improve quality of life in their communities. Do you have any unanswered questions on hydrogen fueling insfrastructure? Write them in the comments section below, and we'll provide feedback asap. For more information on Hydrogen Fueling Solutions for North American Transit Operators, click the 'download now' button below. Located in Europe? Check out our Hydrogen Refuelling Solutions for European Transit Operators here. Download our free white paper to learn about hydrogen refuelling infrastructure for North American transit operators.